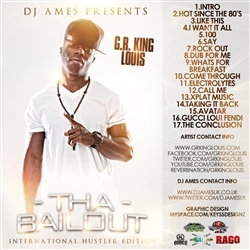 I received the latest mixtape from GR King Louis and gave it a listen. I am posting it up because I think this guy has definitely got promise, though personally I think he has a lot to work on – namely finding the pocket of the beat and making his flow work for each track. But I am very excited to watch this guys growth as he keeps working. Instead of keeping it to myself, figured I would give him some shine now so y’all can hear where he’s at and watch him improve with me. Hit the jump to read more bout him, watch videos and download music.